Access the Amazon Redshift Management Console. Click the Clusters link in the left navigation pane. Select your cluster from the list. Locate the SSH Ingestion Settings group. Note the Cluster Public Key and Node IP addresses. You will use them in later steps. You will use the IP addresses in Step 3 to configure the host to accept the connection from Amazon Redshift. Depending on what type of host you connect to and whether it is in a VPC, you will use either the public IP addresses or the private IP addresses. To retrieve the cluster public key and cluster node IP addresses for your cluster using the Amazon Redshift CLI, execute the describe-clusters command. 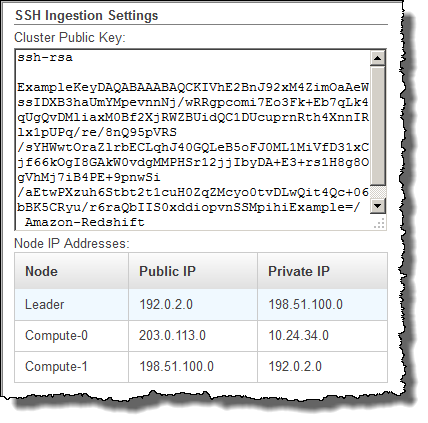 To retrieve the cluster public key and cluster node IP addresses for your cluster using the Amazon Redshift API, use the DescribeClusters action. For more information, see describe-clusters in the Amazon Redshift CLI Guide or DescribeClusters in the Amazon Redshift API Guide.